Home Current Affairs To be or not to be? As a matter of policy, the Campaign confines itself to its specific area of concern but recent events illustrate more general points relating to land and the exploitation of positional advantage. 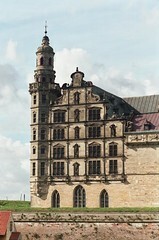 Kronborg Slott (illustrated) is otherwise known as Elsinore Castle, though it is actually a seventeenth century palace in the style known in England as "Jacobean". It overlooks the Öresund which is just a few kilometres wide at this point. All traffic into and out of the Baltic Sea must pass through this strait. In the middle ages, both sides of the Öresund were part of the Danish kingdom and the kings took the opportunity to levy "Öresund dues" on every vessel passing through. In other words, using the look-out tower to keep a personal eye on all the comings and goings, the Danish monarchs exploited a locational advantage to behave like common highwaymen. The income was used to pay for the palace, but, in a bizarre blend of criminality and piety, until the Reformation the kings used some of the spoils from this robbery to support a community of nuns. Naturally, those who had to pay the dues did not like the imposition and this lead to continuous and costly wars. Eventually, the land on the north side of the Sound ended up as part of Sweden. As soon as there was free passage of shipping through the Sound, Copenhagen became an important trading centre and prospered. The king abandoned his castle-palace. The extraction of the ransom was a classic example of rent-seeking, and the moral of the story is that it is not worth the trouble - the Danish kings would have done better to have allowed free passage in the first place, made friends instead of enemies, and charged a land value tax on the cities that would have grown up much sooner had they done so, thereby saving the cost of the wars and avoiding the ultimate loss of a chunk of their territory to Sweden. Territorial disputes are usually about seeking some kind of positional advantage of this kind, for example, to gain access to natural resources or key routes, so it is always a good idea to see if something of the sort lies behind such disputes. This is why the Dardanelles and the Straits of Hormuz have been historically important and contested. But not all territorial disputes are about securing good defensive positions. Since the invention of the nation state, people can feel they have been put in the wrong country due to the way boundaries have been drawn, and sometimes people with different identities are distributed in a way that no boundary could be drawn which satisfies everyone. This need not be a problem; the Swiss, for instance, have worked out a way of allowing the boundaries of cantons to be redrawn if that is what people want, which was the origin of the canton of Jura in 1979. The Swiss system, which allows enclaves, has the advantage that it is not necessary to draw a line which gets all the "reds" on one side and the "greens" on the other. Then there is the case of Åland, a group of islands in the middle of the Baltic. The population has been culturally Swedish since time immemorial, but in 1809, Russia conquered Finland from Sweden and Åland went with it. In 1917, after the Russian revolution, Finland declared independence and held on to Åland. The residents wanted their island to revert to Sweden but the Swedish government were not interested in adding a few rocks to their territory and were certainly not going to have a war on account of them. The issue was referred to the League of Nations which ruled that the islands should remain as part of Finland - the reason being something to do with the distance between the islands and the respective mainlands. People seem to have lived amicably with the situation until 1995 when Sweden and Finland joined the EU. The islanders then managed to gain tax concessions, which makes the place particularly attractive to highly-taxed Swedes, and is why the Baltic ferries are registered at the capital, Mariehamn (population 10,000). Which shows how things can be sorted out if only people are sensible. Unfortunately, people are often not sensible and will use force instead of sitting down and talking to find a compromise. That was went wrong in the the lands that had been Yugoslavia. Pride comes in as well. Politicians to appeal to pride especially when they are not running their economies to the general good. The break-up of the Soviet Empire was a humiliation for the Russians, as many of the countries that became independent had been part of the Tsarist empire for centuries. Other ex-Soviet countries, including the Baltic republics, had enjoyed just a brief period of independence from 1918 to 1938. All of them have ended up with significant Russian minorities. It is also a fact that post-Communist Russia is not turning out to be a very nice country, though that should have been expected. A further complication is that Western Europe is becoming dependent on Russia for its energy supplies. This creates problems all-round, and especially for the ex-Soviets. Politicians in any of these countries would do well to make sure that their Russians did not become a focus of discontent. If there were any areas with significant concentrations of Russians, they would organise plebiscites with a view to redrawing national boundaries, even if it meant having enclaves of Russian territory and the loss of mineral rights, pipelines and other sources of what are, in effect, rental income. It just is not worth trying to hang on to territories where the inhabitants want to be independent or part of another country. Georgia may have been in the right and Russia in the wrong in the latest military action, carefully timed to take place while everyone was distracted by the Olympics. But neither have the Georgian politicians managed their problem with intelligence or realism. Where the Russians are dispersed, as in the Baltic republics, matters are more complicated. The first priority here must be to make sure that economic opportunities are available to all, which means that land value taxation must be a key policy, together with citizenship and other rights. Apart from considerations of natural justice, this would give these detached Russians a vested interest in things remaining as they are. They would have no reason to complain about being in the "wrobng" country. This principle has largely prevented the Israeli Arabs from becoming a source of unrest for the past sixty years - despite the trouble all around, and some discrimination, the Israeli Arabs are well aware that they enjoy greater freedom, security and prosperity than Arabs anywhere else in the Middle East and that is it not in their interest to cause an upset. Finally, there are dangerous military implications which have yet to unfold. Just because we in the west disapprove of the way Russia conducts its business, is it necessary to make an enemy of them? Of course we need to be cautious, and part of being cautious is not to be dependent on them for key commodities. But we should take care not to feed their paranoia with actions and policies that make them jumpy, or by setting up alliances and pacts that would or could not be honoured. That way, a less chauvinistic leadership might just possibly come to the fore.